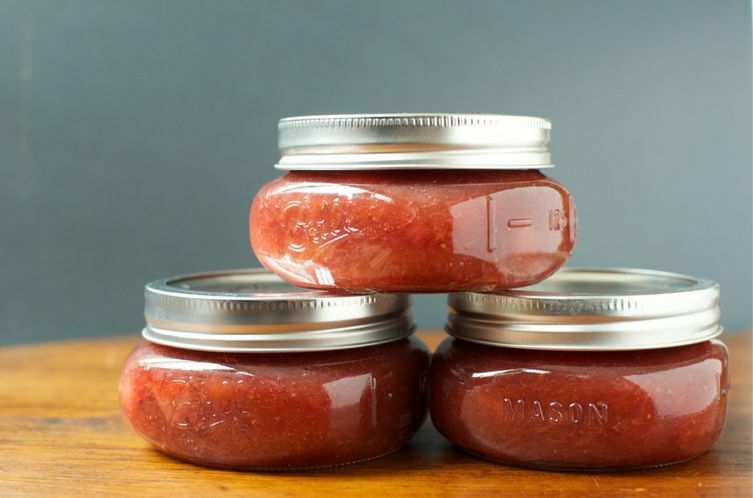 Today: Marisa McClellan from Food in Jars preserves spring's bright red bounty in a Strawberry Rhubarb Jam. Last weekend, my husband and I stayed at an inn somewhere in rural Pennsylvania. The room was comfortable, the meals were perfect, and the resident dog was entirely friendly. What charmed me most about our stay, though, was the giant rhubarb plant growing wildly in the back garden. It reminded me of the large patch of rhubarb that we had in one of my childhood homes, left there by a previous owner. Each spring, it would erupt from a leaf-covered swatch of the backyard and we’d eat rhubarb pie, crisps, and cobblers for weeks. It produced so much more than we could possibly use, so we shared it freely with friends and neighbors. While still at the inn, I contemplated sneaking out under the cover of darkness to liberate a few stalks, but instead decided that I’d go the more honest route and pick up a pound as soon as we got home for a little batch of jam. Other than the occasional batch of marmalade, it’s been months since I’ve made sweet preserves, so this first pan of the season was a joy. 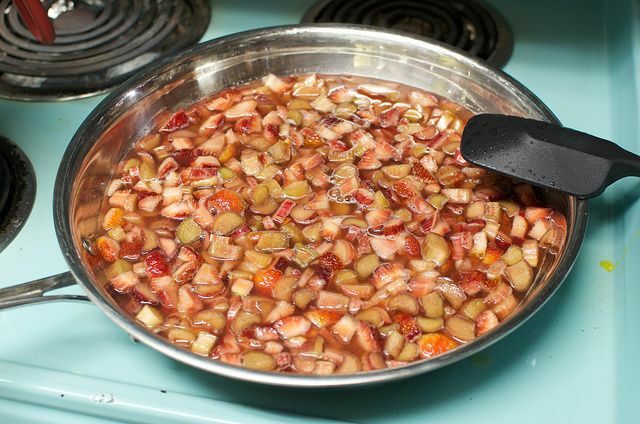 I combined chopped rhubarb, diced strawberries, and sugar in a bowl, and let it macerate. Once ready to make the jam, I poured everything into a 12-inch stainless steel skillet. This is my favorite cooking vessel for small batches because its low, wide shape means there’s more surface area and the water evaporates more efficiently. This leads to shorter cooking times and a good set with less sugar. 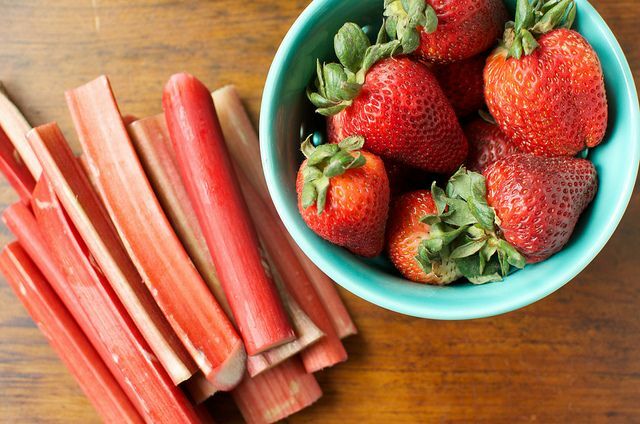 More: Another way to celebrate the happy marriage of strawberry and rhubarb? Compote. This recipe makes just three half pints, which I think is the perfect amount. It leaves me space in the pantry to make a second batch flavored with vanilla bean, and later a third with a lavender infusion. Here’s to small batches and the variety they make possible! 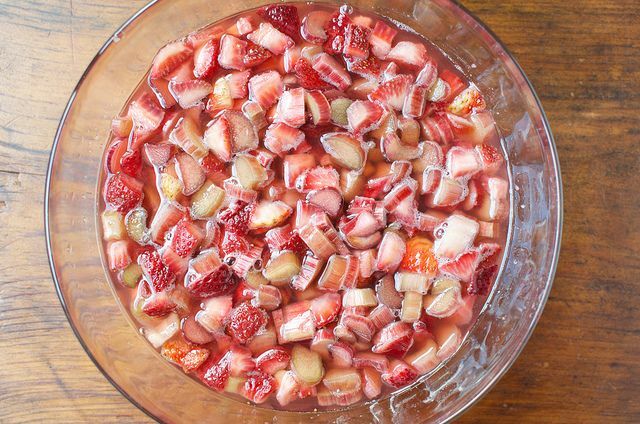 Wash the strawberries and rhubarb well. Hull the berries and dice them into small pieces. 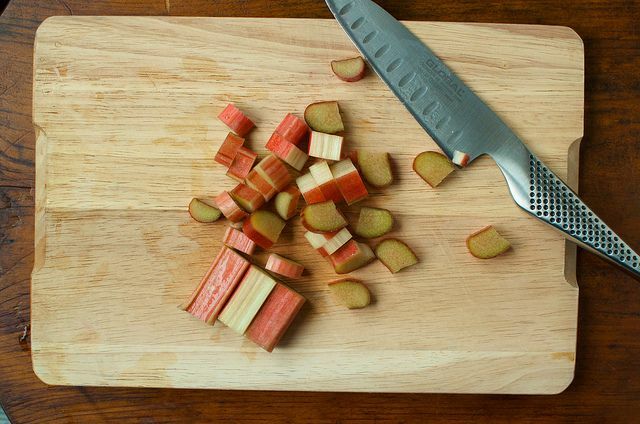 Chop the rhubarb into segments approximately 1/2 inch in size. Place the chopped fruit in a glass or ceramic bowl and cover with sugar. Stir to combine and cover. Let the fruit sit for at least an hour, until the juices are flowing. If you’re pressed for time, you can cover the bowl and come back up to 48 hours later; the sugar acts as a preservative and prevents the fruit from browning. When you're ready to cook the jam, prepare a small boiling water bath canner and three half pint jars and bring it to a boil. Place three new canning jar lids in a small pot and bring them to a bare simmer. Pour the fruit and all the liquid into your jam pot and place it over high heat. For these small batches, I like to use a 12-inch stainless steel skillet, but any low, wide, non-reactive pan will do. Bring the fruit to a rapid boil and stir regularly. Over high heat, this jam should take 8 to 12 minutes to cook. 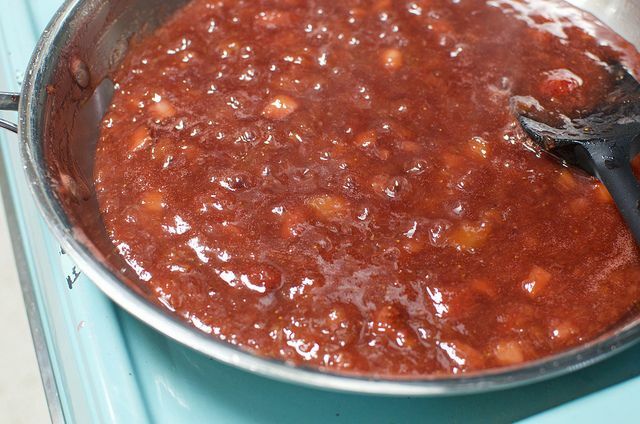 It is done when it is quite thick; you can tell that it's ready when you draw your spoon or spatula through the jam and it doesn't immediately rush in to fill that space. It will also make a vigorous sizzling noise when stirred. Remove the jam from the heat and funnel it into the prepared jars. Wipe rims, apply lids and rings, and process in a boiling water bath canner for 10 minutes (start your timer when the water returns to a boil, not the moment the jars go into the water bath). When the time is up, remove jars from canner and set them to cool on a folded kitchen towel. When they are cool enough to handle, remove the rings and test the seals by grasping the edges of the lid and lifting the jar an inch or so from the countertop. If the lid holds fast, the jars are sealed. Any unsealed jars should be refrigerated and eaten promptly. Properly sealed jars will last for at least a year on the shelf; once opened, they will keep in the refrigerator for 3 to 4 weeks. If I wanted to add a little pectin powder, when should it be added? No sure jell or pectin? I am confused! I have never made jam without it. Many fruits have pectin naturally. Added pectin makes for a firmer set, but you can definitely make many jams without it. See Marisa's comment below about small batch in wide skillet - you cook out enough water quickly for the jam to have a nice, softer set without adding pectin. I made a batch of this last night. It made exactly 3 half-pints. I followed your directions exactly and-WOW! It is SO good! I'm sending two of them off to my Dad for Father's Day-I have to keep one! Thanks for this recipe. by the way, I found the jars at our local Roundys. They come in a 4 or 12 pack. The jars you used for the jam are like none I've ever seen. Where did you find them? Thank you. Is there some brilliant kitchen hack for canning? Don't have a boiling water canner -- some other way to seal it safely with common kitchen items? Any large stock pot will work. If you don't have a rack to put under the jars a wash cloth or small towel will do. As long as the water is a few inches above the jars. Just finished my first batch, looks great! One question, any tips for the foam? Should I add some butter or skim it off? It did solidify perfectly, I was worried not using pectin, but it was perfect! The foam does absolutely no harm. Skimming is an aesthetic choice that you're welcome to make. But I never do it these days. Any advice for managing the splattering while still stirring regularly? I use one of those mesh splatter guards, but still get zinged every time I slide the spoon in to stir! A pan with taller sides might help. It also sounds like you might need to turn the heat down a little if it's boiling so vigorously that you're getting burned. Thanks for the follow up comments! I do try not to boil too hard - it just seems as the mixture gets thicker, any amount of boiling makes for blurby splatters. Hazards of cooking. And the jam is delicious, of course! Rhubarb does have a tendency to darken some, particularly if you use one of the greener varieties. If your recipe was similar to this one, it's certain to be safe, just discolored. Spread a bit of this on toast for breakfast this morning and loved it so much I ended up mixing it with yogurt for an afternoon snack, too. Will need to make this again before I end up running out! Thank you! I'm so happy to hear that you like it so much! Pretty sure this is some of the best --and prettiest-- jam I've ever made. Thank you! So missing spring in centralPA! have only made jam before using some sort of pectin product. i am assuming this will not be a firm consistency, am I right? It will have a softer set than jams made with pectin. However, when you cook it in a wide, low pan like a skillet, you're able to cook the water out more quickly, heat the sugars faster, and will wind up with a very spreadable, non-runny product. I hope to make a double batch. I actually don't recommend that you double this recipe. The reason it works without additional pectin is the fact that you put so little into the pan and thus it's able to cook the water out quickly. It will not set up as well if cooked in a double batch. Have you canned using "Coconut Sugar" it is low glycemic with the texture and consistency of granulated sugar. My page on FB is www.facebook.com/iherbcom and I like to share healthy topics for my viewers. This look delicious but I would be interested in trying it with the coconut sugar. I have used coconut sugar and I find that it gives a very strong flavor to jams and preserves. I tend to use it exclusively in fruit butters, where its color and flavor don't have as much of an impact in the finished product. Looks lovely!!! Can't wait to make this.